The U.S. economy is likely to remain in its low-growth trend and we don’t foresee a recession, given that the Fed has become less inclined to raise rates. Brexit should be largely transitory for Britain, but may reveal a variety of weaknesses within the European Union. The U.S. presidential elections reveal a myriad of changing views within the population. Changing policies in Washington will be important to monitor. Domestic equities, diversified across capitalization sizes, maintain the lion’s share of stock allocations. Our view toward equities remains generally positive, although we expect moderate returns, absent easy policy from the Fed. Our style bias remains in favor of growth at 60/40. We believe slow economic growth and low inflation, along with low global interest rates and high geopolitical risk, will keep U.S. interest rates near current levels. We introduce a commodity allocation this quarter, utilizing gold. We believe gold can help address risks related to global central bank policies. Although U.S economic growth remains far below its long-term average, the economy continues to move forward in one of the longest expansions in modern history. The stability of the economy, more so than inflation or the strength of the labor markets, compelled the Fed to begin raising rates last December. However, with domestic economic data indicating potential pockets of instability, along with Britain’s decision to exit the European Union (Brexit), the Fed has recognized there is enough uncertainty to put further rate hikes on hold. We believe this decision is a good one, and absent future Fed policy errors we do not foresee a recession at this point in time. Equity and bond markets around the world were shocked with the British vote to leave the EU. Equities became volatile, while bond yields in developed countries continued to decline. In our view, Brexit may create some near-term uncertainty for the British economy, but we expect the problems to be mostly transitory. The British economy will benefit from rising exports as a result of the weak British pound. Furthermore, the Bank of England has telegraphed its intention to help address uncertainty in the country’s financial system. For these reasons, we believe Britain will work its way through its departure from the EU. However, for the rest of the EU, Brexit opens a Pandora’s Box of potential problems. On the immediate horizon, the uncertainty is likely to slow already low levels of economic growth. Germany is particularly dependent upon exports, including those to Britain. Perhaps more important is the weakness of the Italian banking system. Like many other peripheral EU countries, Italy has yet to address the billions of euros of bad loans dating back to the 2008 financial crisis. Policies thus far have generally been Band-Aids that only defer problems rather than fix them. Brexit may bring these problems to the forefront, along with the EU’s limited political cohesion and inability to address conditions in a consistent manner. Accordingly, one of the longer term risks we see from Brexit is the potential for the EU to begin unravelling. We have long held an overwhelming domestic bias in our portfolios, recognizing weak foreign growth and elevated levels of geopolitical risk. This posture has helped insulate portfolios from risks like Brexit; however, we recognize that global markets and economies have become increasingly interconnected. If Britain or the EU were to dip into recession, this could cause the U.S. economy to grow even slower. Still, we believe the U.S. economy is likely to prove itself as the strongest one standing among developed countries. Of course, it is a presidential election year and it’s important to acknowledge the changes taking place in Washington. For investors, it’s important to remember that Fed Chair Yellen is likely to have a much more immediate impact on portfolios than either Clinton or Trump. Still, the political forces at work reveal changing views within the country. Many of the same issues that elevated Trump also buoyed Sanders. So, whether our next president is Trump or Clinton, the issues themselves will remain. These include policy changes related to trade, taxation, immigration and income inequality, to name a few. Policy changes take time to work through the political process but, as Washington adjusts, we will carefully monitor the trends, which will affect our views toward issues including inflation, productivity, growth and valuations. We find it ironic that even as the Fed has embarked on a policy to raise short-term interest rates, the result has actually been lower long-term rates. One could argue that the Fed’s recent policies have been an amalgamation of unintended consequences. Nevertheless, one fairly consistent outcome of Fed policy over the past few years has been the relationship between easier monetary policy and rising equity valuations. 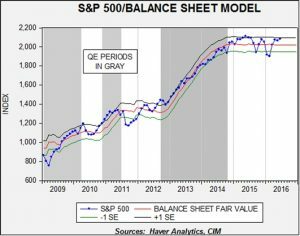 We saw a pretty clear relationship during the three rounds of Quantitative Easing (2009-2014), and we have seen it again this year in February and June, when the Fed clarified a slowing path for raising rates. For equity investors, this indicates higher potential return when the Fed chooses a path of easy monetary policy, which is a possibility going forward. 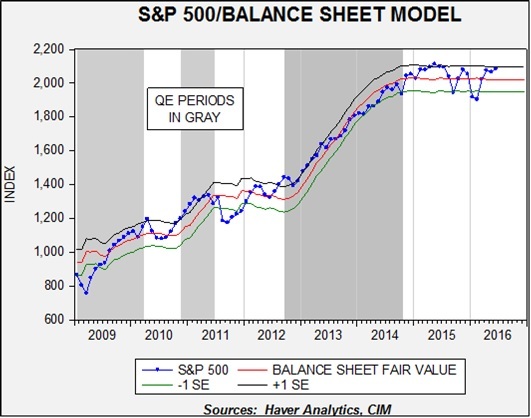 Absent help from the Fed, we believe equity returns are likely to be moderate. Earnings growth remains low, while valuations are somewhat elevated. This profile isn’t necessarily negative, but we believe equity investors should temper their expectations for returns over the next several quarters. Except for a relatively small allocation in our most aggressive portfolio, our equity allocations remain entirely domestic. Our economic viewpoint toward Europe reflects a much weaker growth environment than that of the U.S. In addition, we believe Japan is likely to struggle, and perhaps enter recession, as the yen strengthens and harms Japanese exports. Within the U.S. equity allocations, we remain diversified across capitalization sizes. For large cap allocations, we are overweight technology, energy and consumer discretionary. We have a particular emphasis in energy that adds exposure to crude oil prices, which have the potential to increase as U.S. production declines and global geopolitical risks remains elevated. We are underweight financials, healthcare, utilities and telecom. Our style bias remains in favor of growth over value (60/40). Interest rates around the world remain historically low and rates are actually negative across a wide range of maturities in many countries. Low and negative rates reflect a variety of factors, including weak global economies, disinflation, aggressive central bank policies, enormous liquidity and investor risk aversion. So, even as U.S. rates are also historically low, domestic bond yields are actually pretty high relative to many other developed countries. We continue to include a range of different maturities in our bond allocations. One important benefit that bonds have provided over the past several quarters is diversification. Oftentimes when equity markets decline, bond prices surge, particularly for longer maturity Treasuries. The inclusion of longer maturities has benefited portfolios and we continue to include them. Our allocations include corporate bonds as well as U.S. Treasuries. We continue to believe real estate can play a constructive role in portfolios, particularly where income is an objective. Although this asset class has become increasingly similar to equities, and its diversification benefits are now more limited, we believe strong fundamentals can continue to benefit investors. Valuations are high for certain industries, but we believe an attractive return/risk tradeoff is available when factoring in low interest rates and strong foreign capital flows. This quarter we introduce a commodity allocation, which is something we have avoided for many quarters. After several years of poor performance, commodities have provided some of the highest returns this year. We have concerns that low or declining global growth may cause commodity prices to turn lower; however, we believe gold provides ballast to the risks central bankers are creating with negative interest rate policies. Gold can also provide a safe haven during periods of elevated geopolitical and currency risks.